Has regionalism's time finally come? With the state and several large cities facing severe fiscal challenges, mayors such as Bronin and others, including the state’s major municipal advocacy group, are pushing for more regional sharing. “I think we need to go big,” said former House Speaker J. Brendan Sharkey, a leading advocate for regional efficiencies, at a CTN/ Old State House forum on regionalism on Feb. 21. Somewhat surprisingly, a poll released this winter suggests that residents would be open to more regional services. The fiscal difficulties are well known. The state is facing a budget deficit of around $1.5 billion in the first year of the upcoming biennial budget. In Hartford, Bronin and the city council are trying to whittle down a $20 million deficit in the current budget, and face a projected $50 million deficit in the coming fiscal year. Without state help — regionalism would only be part of the solution — the capital city faces insolvency. Hartford Mayor Luke Bronin in West Hartford. Three of the state’s other large cities are in the same boat, albeit in slightly better berths. A report in January titled “Connecticut’s Broken Cities,” written by Stephen Eide of the the Manhattan Institute, co-sponsored by the Yankee Institute, both conservative think tanks, states that Waterbury, New Haven, Bridgeport and especially Hartford are to varying degrees buckling under retirement-related debt, burdened with poverty and — except for New Haven — forced to levy high taxes, which discourage business development. 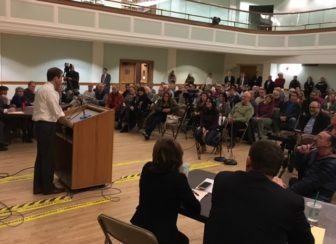 Bronin told his suburban audiences that more than 100,000 people commute into Hartford each day to work, tying the region’s health to that of the city. The obvious implication is that if the city becomes untenable for employers, there will be a negative impact on the suburbs. But does being codependent mean they will work together? Regionalism is a broad and imprecise term; it can refer to anything from two towns sharing a brush chipper to a city-county merger, as took place in cities such as Indianapolis, Jacksonville and Nashville in the last century. Though some, such as Bloomberg columnist Justin Fox, have argued that Connecticut is hurt by not having a large city, these are no plans to create one by merging towns, or to usurp local control of zoning or education. 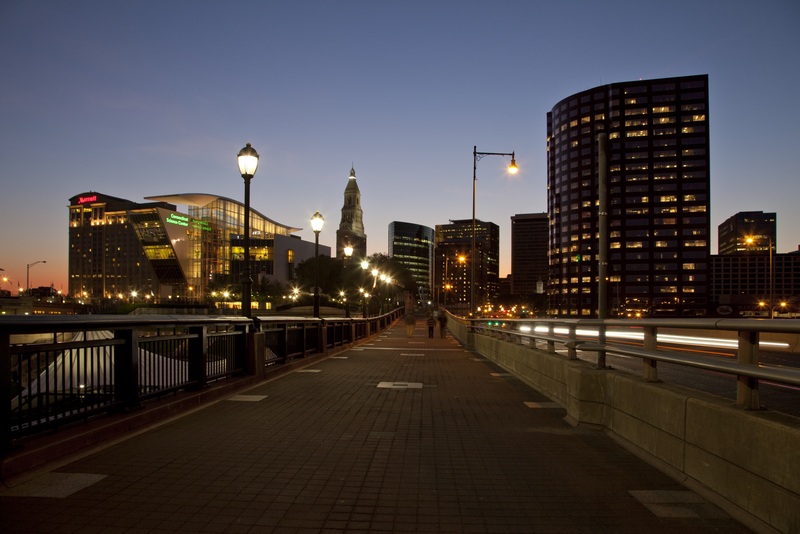 Regionalism in Connecticut usually refers to the provision of services or sharing of resources by two or more towns, or by regional entities. That’s what is growing. Though Connecticut did away with the remnants of county government 58 years ago and always pays homage to home rule, there’s been some level of regionalism for a long time. For example, the Metropolitan District Commission, Greater Hartford’s water and sewer authority, was founded in 1930. Regionalism picked up a bit in the 1970s and 1980s when some of the (largely ineffective) 15 regional planning agencies became councils of government. The councils, or COGs, as they are known, have less power than counties in many other states, but nonetheless have been able to promote a fair number of regional activities. The Capitol Region Council of Governments, which comprises 38 towns in Greater Hartford, has been in the forefront of regional service-sharing, initiating regional purchasing, police communications, animal shelters, online permitting, homeland security planning and other programs. Regionalism took a step forward with the creation, by Speaker Sharkey, of the MORE (Municipal Opportunities and Regional Efficiencies) Commission in the 2009-10 session of the General Assembly. The commission produced dozens of ideas for towns to save money through regional cooperation, ranging from regional insurance purchasing and training of town employees, to a common school calendar, a common anti-blight code and many others. The commission promoted the use by towns and school boards of the state’s broadband Nutmeg Network, which allows towns to expedite permitting, human resources and a variety of back office functions. A major initiative reduced the number of planning agencies from an unwieldy 15 to nine, with the hope of getting to eight, and made them all councils of government. 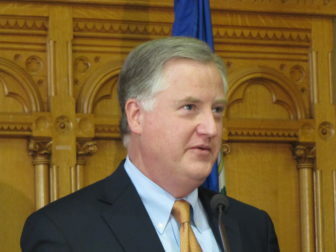 Sharkey said in a recent interview that when the MORE Commission started, it discovered that state statutes didn’t allow or encourage much regional activity, so the legislature had to change laws to “overcome the obstacles.” For example, the legislature created a “uniform chart of accounts” so that towns and school boards used the same financial reporting standards. Another law, championed by Senate President Martin Looney, allows towns to share property tax revenue from a development, rather than compete with each other for the whole project. As it happens, four towns in Eastern Connecticut are doing just that with the 220-acre Quinebaug Regional Tech Park, known as “The Q,” which opened last year. It is located in Putnam, which put up 60 percent of the local cost, said economic development director Delpha Very. Brooklyn added 20 percent and Scotland and Pomfret 10 percent each, and each will so share in the revenue, if the project is successful. A regionalism project officials point to as a success is the 2009 consolidation of the state’s probate courts, which reduced the number of courts from 117 to 54. For all of these initiatives, there is still not a consensus that regionalism is worth the trouble. Eide, in his “Broken Cities” study, puts little faith in regional solutions; he endorses the views of conservative planner and demographer Wendell Cox that small governments tend to be more efficient than larger ones. 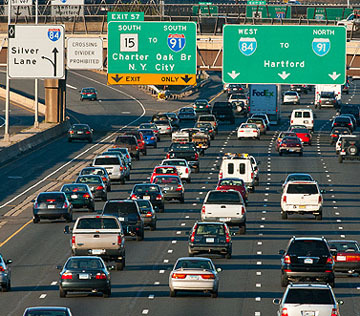 Ride urges cities to cut spending, but concedes Hartford needs state help. On the other hand, a 2013 study by the New England Public Policy Center, an arm of the Boston Fed, determined that regional sharing of services saves money — in some cases. The authors suggested that the greatest potential for regional cooperation can be found in capital- and technology-based services and others that require specialized skills. Labor-intensive services offer the least potential for regional savings, the report says. The study identified three services that would lend themselves to cost-saving regionalization in Connecticut: Emergency call handling and dispatch, public health, and local pension administration. If the state were to consolidate its 106 emergency calls centers, overall costs would be reduced by 60 percent. Merging the 73 local health districts and 59 state and local pension administrators could also save millions of dollars. The study estimates that about 20 percent of municipal spending could be lowered by regionalization. Efforts to make these consolidations have thus far failed. In the case of the call centers, though the technology exists to have many fewer call centers, local police chiefs don’t like to give them up, Sharkey said. The effort to consolidate health districts may tell us where regionalism is going in the state. With the state and several large cities struggling, the constituency for regionalism appears to be growing. 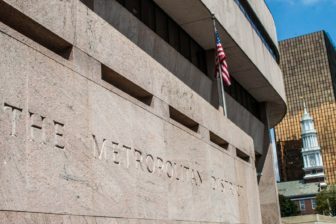 Hartford activist and planner Toni Gold suggested it would grow faster if someone did a study comparing the costs of government in Connecticut’s fractionalized metro areas with the cost in comparable metros with unified government. “I think people would be shocked,” she said. The Connecticut Conference of Municipalities, which advocates for 163 of the state’s towns, came out with a report this winter boldly titled “This Report Is Different.” In it, CCM calls for a slew of regional initiatives, including removing service-sharing agreements from collective bargaining, not allowing towns to bargain away the ability to regionalize services, and having the state take over the cost and delivery of special education services. Sharkey supports a state takeover of special ed — it is an example of “going big” — saying it would cut back on the litigation and administration that drive costs up, and not penalize towns that run good programs only to be flooded with new arrivals, or whose budgets spike when a single child with profound needs moves to town. Sharkey said there is a structure in place — the state’s five Regional Education Service Centers — that could run the special education programs. The state would pay for it; the towns would no longer get their special education grants. Thus far, MORE Commission members and others have been feeling their way, weighing ideas to determine if they make sense. Towns and regions are different, their needs vary, one size doesn’t fit all, said Sharkey, who suggests that the COGs be empowered to continue this work, to “pencil out” various proposals. The COGs, which are run by town leaders, could become the counties of the 21st century. For example, last fall a draft bill to consolidate the 73 health districts into eight, on the old county lines, leaked from the state Department of Public Health. The funding structure would have spiked the costs in some towns. Officials howled, the idea was pulled back. There’s now a new bill, with significant changes. The consolidated districts will be the COGs, not the counties, and the funding structure will “try to be as revenue neutral as possible,” said department spokesperson Maura Downes. The Hartford headquarters of the MDC, the regional water and sewer agency. Perhaps they are. In a poll by Inform CT, a non-partisan research group, of more than 500 Greater Hartford residents last fall, 76 percent of respondents said they would support shared public health services; 68 percent said animal control could be regionalized; 66 percent said education could be shared (there are some regional districts and programs); 65 percent believe library services could be combined; and a surprising 61 percent backed the prospect of regional public safety. Some residents were critical of the poll when it was reported in December by The Hartford Courant. But if it is even generally accurate, we may be seeing Puritan localism slowly giving way to Yankee thrift.